How do you find your way home when your home no longer exists? For 17-year old twin sisters Sammie and Ronnie and their father, Willis, the answer to that question becomes a life raft when they are displaced after Hurricane Katrina. Running Away to Home, a YA verse novel, tells the story of two brave sisters, a repentant father, and the amazing triumphant spirit of familial love. After leaving New Orleans for Atlanta, Ronnie and Sammie are separated and find themselves living in different parts of the city. Each sister is lured by false promises of love and security as they initially believe the people they encounter. As a YA verse novel, this story relies on poetry to express the intimacy of sisterhood and the triumphant spirit of its characters. Older YA readers will be moved by this family’s journey in the wake of one of the most memorable historical events our nation has experienced. 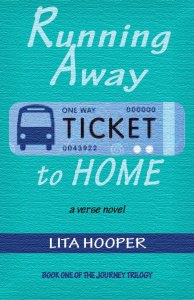 Today, Lita has stopped by to talk about Running Away to Home and to give away five copies to our readers! The giveaway is open to those with U.S. mailing addresses. Don’t forget to enter the drawing at the end of the interview! What drew you to write about the aftermath of Hurricane Katrina? Why did you decide to write about it in verse? I remember being so overwhelmed with emotion when it happened. The thought of being separated from family members is really devastating to me, so as I watched the media coverage on television, that’s all I could think about. How could people find one another? This is has happened to the black family throughout history. During Reconstruction, newly freed black men and women sought family members throughout the South. During the Great Migration, families were torn apart by a need to find employment in the North. I wanted to give voice to this experience and because I am primarily a poet, verse seemed natural. I like persona poems, so this project fit nicely with what I was already doing. Tell us more about Sammy, Ronnie, and their relationship with each other and their father. Well, the girls are really interesting to me because I’ve always been fascinated by twins. I thought about how a teenager would feel during this really emotional time and how he or she would deal with the trauma of losing a home and being displaced. That’s when I decided to give to very different perspectives…to work with twin protagonists. I think the girls are very strong but they don’t know how strong they are until the storm changes their lives. I think they’re both very vulnerable but in different ways. Sammie is very simplistic in the way she approaches her survival. She has something to prove to her sister and father, so she takes advantage of being displaced to become the “strong” twin. Ronnie needs to be cared for, something she has longed for since her mother died. She loves her family but doesn’t know how to put herself first. The girls love their father, but when the storm hits, the family was really dysfunctional. The storm changes everything. Literally. The search for home and family is an essential part of RATH. Why were you excited about these themes? “Home” has a broad meaning, and I was interested in delving into the layers….I wanted to play around with the idea of running away from one thing in order to find oneself back home. Teenagers always run away from home in YA books. I was interested in creating characters who wanted to return. Being home was so much more than just being in their home town. It was reconnecting with family and fully understanding how fortunate they were. It was about trusting the voice inside, even when others doubted them, and being guided back to where they belonged. I find the idea of family and geographic location interesting because I have always wanted to move and live in a variety of places. Even as a child, I wanted to relocate every few years, but my friends always thought that was odd. In a way, this book is a personal exploration of why traveling and relocating are important to me. What are you proudest of in RATH? What did you learn while writing it? I’m proud that I finished my first YA verse novel! The genre is really exciting to me. I never saw myself entering this space, but after reading Make Lemonade by Virginia Wolff, I was hooked. I have been a poet for many years, but I found that book when putting together a list of books for my son’s homeschool reading assignments. Boy, that was a game changer. So RATH is always going to be special to me because it represents my first attempt at YA and at the verse novel. Are there any other novels in verse that you would recommend to a YA audience? Do you have any recommendations for teens who are looking to learn more about Hurricane Katrina and its aftermath? I like the entire series by Wolff (Make Lemonade, True Believer and This Full House). I also really love the character-driven Out of the Dust by Karen Hesse (a classic verse novel), and Andrea Davis Pinkney’s beautiful simplicity in The Red Pencil. Brown Girl Dreaming by Jacqueline Woodson is just amazing and so important given the times we are in, and Under the Mesquite by Guadalupe Garcia McCall is filled with gorgeous verse. I would recommend teens watch Spike Lee’s When the Levees Broke: A Requiem in Four Parts. It’s a documentary about Katrina. The footage and interviews are amazing though heartbreaking. I’m planning to read Erin Schneider’s Summer of Sloane, Aditi Khorana’s Mirror in the Sky, and Mia Garcia’s Even if the Sky Falls. So many great books! Thank you, Lita! If you like what you’ve heard about Running Away to Home, you can now enter to win a copy of the book. Only those with U.S. mailing addresses are eligible for this drawing. 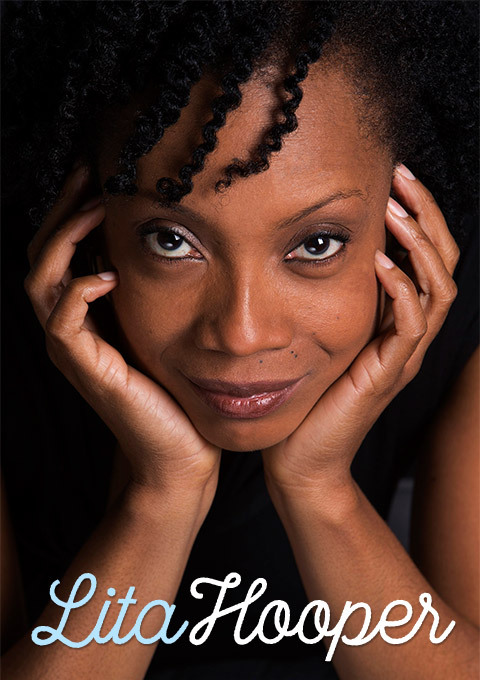 Lita Hooper is a poet and YA author whose young characters are challenged but triumphant in the wake of historic events. Her work has been published in various journals, magazines, and online publications. She is the author of Thunder in Her Voice: The Narrative of Sojourner Truth (Willow Books). When she’s not writing, taking pictures, or traveling, she teaches writing and designs online courses. wow I think this is really nice of you to give away this books Ms. Hooper. even tho parts may be sad. it seems to be a story of hope? I’m not the best reader but can read aloud w/ freinds if I win copy. thanks. also thanks Rich In Color bloggers.